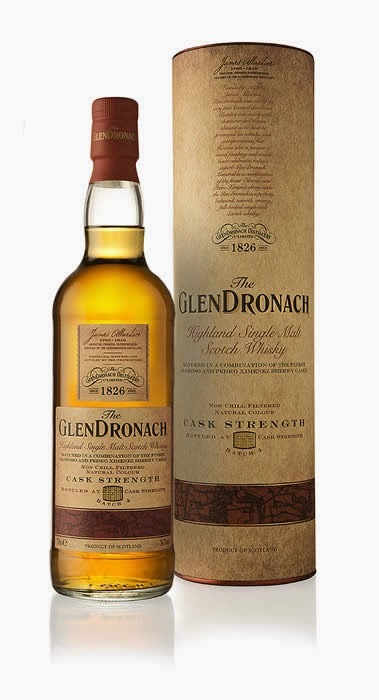 The fourth batch of Glendronach's Cask Strength expression is bottled at 54.7% alcohol and comprises 17,806 bottles, The GlenDronach Cask Strength is a delicious, creamy sherry bomb! The whisky sensationally explodes on the palate with dark fruit, ginger and oak flavours at the fore, and with gingerbread, barley, roasted coffee beans and a hint of walnut softening to a long, satisfying finish. Taste: Vibrant oak spices and warming stem ginger complement the rich sherry and dark fruit characteristics. Waves of sour plums and subtle gingerbread combine with stewed barley and roasted coffee beans, softened by a gentle hint of walnut.